Tools of divination are often shrouded in mystery as far as their actual origin, and the Tarot is no exception. There are many myths about how Tarot Cards came to be and where they originated from. The most recorded history comes from Italy in the early fifteenth century, although the origin of the word itself is French. It is thought that the Italian word "tarocco" (plural "tarocchi") was used initially, and that the terminology came about nearly a century after the cards came to be. One of the earliest Tarot decks was the Visconti-Sforza Tarocchi Deck. There are similar versions of it still around today. Tarocchi was actually a game that had little to do with fortune telling. When the major arcana cards were added, a game known as Triumphs (Trumps) was often played, which is much like the game of bridge today. It is not exactly known when this card game became synonymous with fortune telling, however the major arcana cards have always held a great deal of symbolism. It has been said that the first Tarot deck was created as an amusement for Charles VI of France. 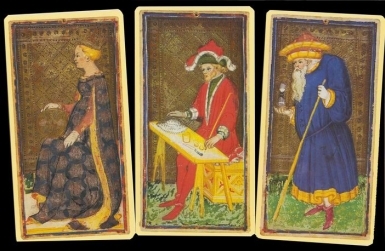 There is a Tarot deck on display at the Biblioteque Nationale de France, however the hand painted cards appear to be Italian in origin and from the fifteenth century rather than the fourteenth as previously thought. Jacquemin Gringonneur was commissioned to paint three decks of cards for Charles VI in 1392, but they were most likely regular playing cards. Tarot decks consist of 78 cards, 22 being major arcana (Latin for "big secret") and 56 minor arcana. The major arcana are the ones that have come to represent a person's travels through life and periods of time that are significant in their personal journey. They are often called the "heart" of the tarot deck itself. The minor arcana includes four suites (wands, coins, cups, and swords) with fourteen cards in each suite. These are as follows: Ace, One, Two, Three, Four, Five, Six, Seven, Eight, Nine, Ten, and then the Court cards (Page, knight, King, and Queen). The minor arcana resembles the standard 52 card deck, with the pages being the only difference. It has been speculated that the modern playing card deck was originated from the Tarot, with the Joker being the only representative of the major arcana. The arcana does include a "Fool" card, but the Joker card originated in the United States during the middle 1800's as a wild card for poker. Aside from that, the standard card deck did originate from the Arabic regions several years before the Tarocchi game was conceived and is similar to the Islamic Mamluk cards. One All forms of playing cards were condemned by the Church, especially in the Middle Ages. As early as the fifteenth century, they were thought to be tools of the "devil" by the Church's leaders. There was of course, the association with gambling and personal gain from playing these cards as well as the time spent being idle while playing them. However, even before the popularity of using the Tarot as a way to tell the tale of a person's journey in life, cartomancy, or the use of playing cards as a divination tool, had been done by occultists in secret due to the Church's stronghold at the time. So certainly the correlation between cards and fortune telling did not originate with the Tarot itself. The Tarot was however, the inspiration for many Italian Renaissance writings and poems. The major arcana cards especially inspired poetry that would chronicle a person's life and fate. It is possible that these writings inspired the French occultist Jean-Baptiste Alliette (pseudonym "Etteilla") to design the first Tarot deck specifically used for fortune telling in the late 1700's. Much of his first work was in response the myths about the Tarot that had been written about by a clergyman named Antoine Court. Court maintained that the Tarot was inspired by the Egyptian book of knowledge. There is very little evidence to corroborate this, but it certainly created quite a stir. Etteilla then wrote his own book which was in response to this that in essence said it was merely a way to tell a story of a person's life and be entertaining. The cards he designed were with the intent of being used as a method of telling the story of someone who has touched or focused on the cards. It has been in the last century that the Tarot has been marketed successfully as a tool of divination. A mystic by the name of A.E. Waite gave instruction to Pamela Colman Smith for a deck that has become one of the most popular in the United States today. The deck was published by the Rider company and became known as the Rider-Waite deck. It is very simple in its design, yet in its simplicity there is much symbolism. Church inspired cards such as the Pope and the Pappess became the Heirophant and the High Priestess. The minor arcana has its place as well in readings, as they are thought to represent the four elements. Wands are fire (ambition and passion), cups are water (emotions), swords are most often air (purity of mind), and coins or pentacles represent earth (things that are solid such as tasks completed). The court cards generally represent the person or others in the person's life. Keep in mind, these meanings are subjective, as the cards will mean different things for different people. These are simply some basic descriptions of the meanings and symbolism. One important note about tarot reading is when a card shows up in reverse. This indicates that the original meaning of the card is the opposite. If a card reading is done and for example, the Tower comes up in reverse, instead of meaning chaos, it would mean order. The card that probably has the most misconceptions is the Death card. The card itself, when it comes up in a reading rarely means the literal sense of death. It is more that it is an end of something or a time of great change. 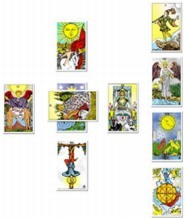 There are different ways that the cards can be laid out for a reading. The important thing to remember if you are receiving a reading is to hold the cards and focus on your life up to that point. Focus on dreams, ambitions, and goals. When you are finished, the cards are handed back to the one doing the reading. The layouts are varied and usually dependent upon what the reader is most comfortable with. A popular one is the Celtic Cross simple ten card spread. The card representing where the person is at in the present is laid down first. The second is laid over this card, indicating what is the greatest opposition. Then one card is placed on each side of the two in the middle. The one to the right represents events well into the past, with the one below representing the events that have most recently happened. The card to the left indicates the near future, with the card at the top being the most positive outcome. The remaining four cards are placed in a row, one above the other, to the right of the cross. The one at the bottom indicates what will affect your present and near future situations. The one above that represents the outside influences you will face, with the one directly above being your wishes and the things you are afraid of. The final card indicates the final end result, which of course is not set in stone. There is also the Zodiac, which is usually only done a few times a year. This is a much more complex layout, involving nearly all of the cards laid out in a Zodiac pattern. The simplest reading to do is one you can do yourself. Simply shuffle the cards as you contemplate, then lay the first three out side by side. This can be done every day if desired, to give guidance and answers for the day ahead. However you decide to do a reading, it is important to note that many of the interpretations are specific to the individual. None of it is meant to be a hard and fast rule as far as definitive answers. It can however be a guide to show someone the path their life is taking and the direction it will go. As in all things, it is up to you.